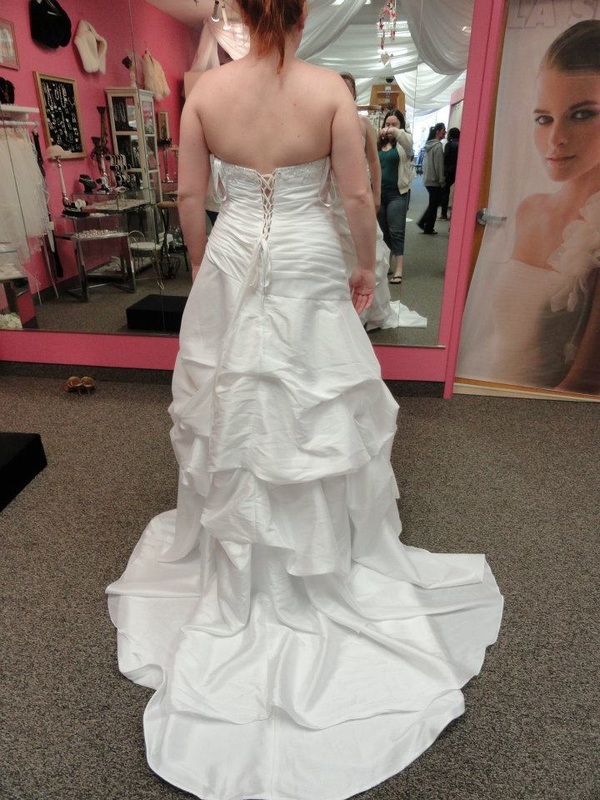 I started looking for my dress the summer after we got engaged (which was May 26, 2011). I knew our wedding date was going to be a ways off still, but it doesn't hurt to look, right? So I grabbed my MOH and took her dress shopping. I also went with my mom, aunt and sister. I am THE most indecisive person in the world. It's terrible! I liked so many dresses but they either were out of my price range or were just.. missing something. 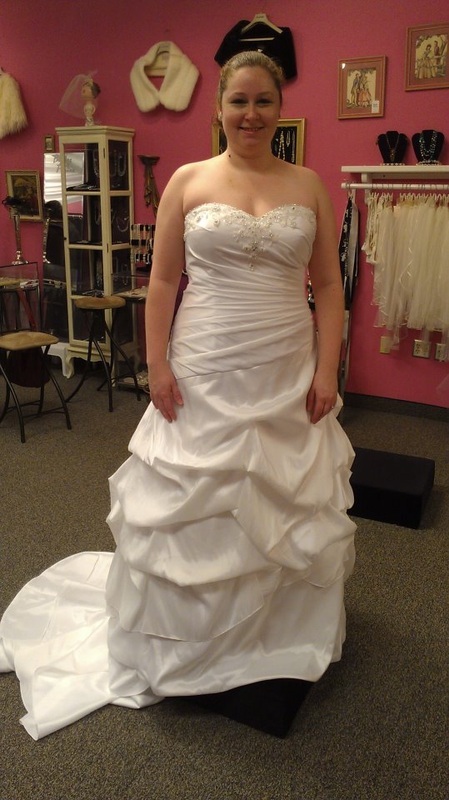 I tried on a variety of dresses and ended up with "the one". I never thought I'd get that "feeling" other brides get, but I did. I didn't want to take it off. And the funniest part was that it was TOTALLY not what I expected. I thought I hated one of the aspects of the dress but now I couldn't picture it any other way. Do I second guess my self? All the time. But then I pull up a picture of me in the dress and just smile. It's too big right now but it will be altered. It has a corset back so even if it's not 100% perfect, it will fit. I really liked this one. It was pretty and just a little different. But something was missing.. maybe it just didn't feel "bridal" enough? 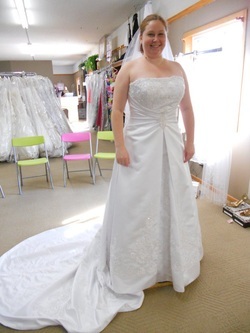 This was at Carrie Johnson Bridal - also a great place to go, I was a little sad about not getting my dress there because I enjoyed my experience! Another gorgeous option from Carrie Johnson Bridal. This one is more traditionally bridal. I was bad and didn't look at prices. I strongly felt this would be out of my price range! Excuse my closed eyes.. haha. 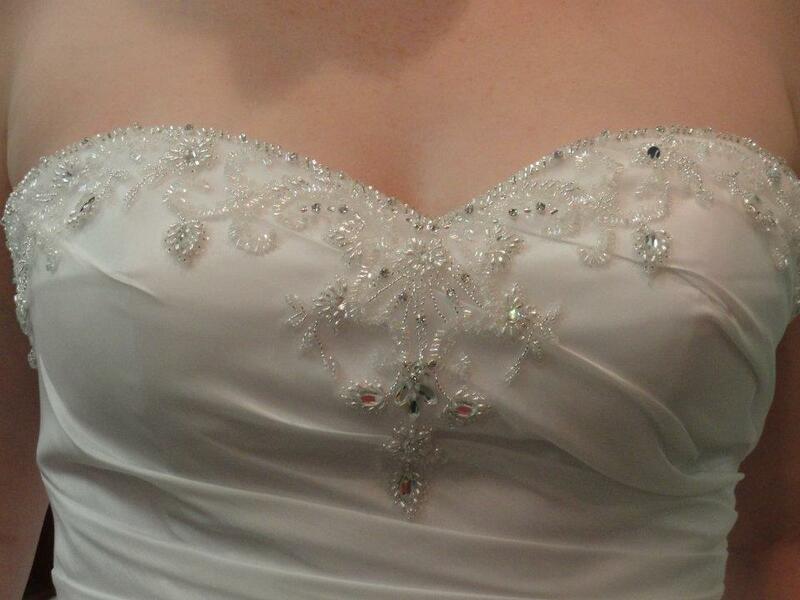 This was at David's Bridal. The photo doesn't do the dress justice. I loved the lace and the hints of sparkle all over the dress. Unfortunately, I'm just not sure if it's "me". My DB experience was.. ok. I felt like they were trying WAY too hard to be like Klienfeld's. I appreciate trying to give that experience to brides on a lower budget, but it wasn't done well. Plus the consultant kept pulling dresses I hated - except this one! The others were not at all what I wanted, even though I showed her photos of what I liked. 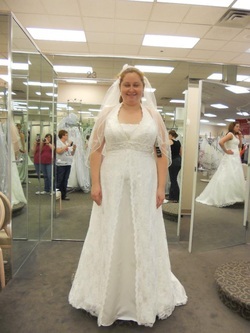 Ok, I know, just get to my dress right? But I just had to mention one more. This one is easily my second favorite. 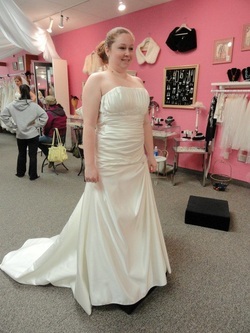 If it had been the price of the dress I got, I would have gotten it. But it was over twice the price! 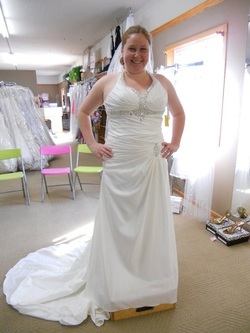 I tried this on at Brides of France and loved it, but out of my price range. Here it is! ROSS - GO AWAY if you're still here! NOT AT ALL what I thought I wanted. I thought I didn't like pickups. I thought I wanted a halter or v-neck. Nope! Haha. It will be taken in as I said earlier. I think I'm going to see if there's a way to make it a little poofier on the bottom. Not a lot, just a little. Anyways, I can't wait to wear it!